Alia Bhatt's sartorial choices have always been the best in the business. Well, considering how she is always at the top of the game when it comes to fashion and style, it is not surprising that she wows us with her promotional looks once again. For the promotional spree of Kalank, the diva chose to keep it as traditional and ethereal as possible. In a series of gorgeous ethnic looks, the diva surely got our attention. 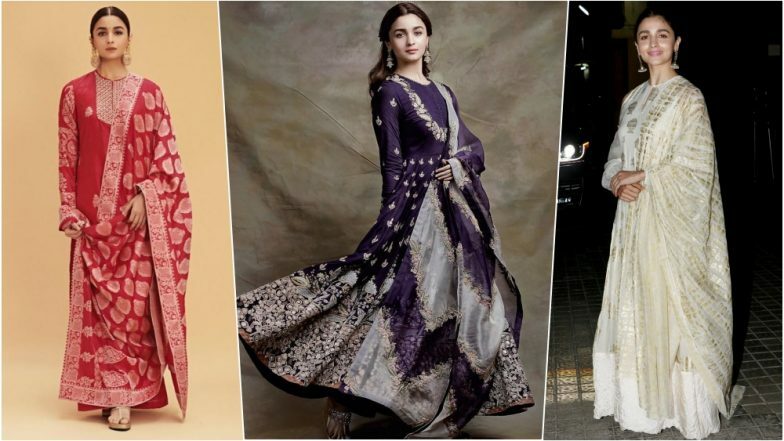 The promotions of Kalank is going to be quite exciting as Alia Bhatt will be sporting more and more ethnic fashion. Ever since the trailer launch, Alia has been donning some impeccable looks. The best part about her looks is that they are in variation so you've got quite a few options to take style inspiration from. One of her looks involves her wearing a gorgeous red ethnic ensemble by Ekaya Banaras. Without it having all the excess embellishments or prints, the ensemble is truly a beaut. Another pretty look that she chose for the promotions is an Anamika Khanna creation. The lovely purple Anarkali with its variant designs and minimal makeup is just too pretty for words. The third look sported by Alia was from House of Masaba. With a halter neck and cold shoulder sleeves, Alia truly looked like a vision in white. Kalank also stars Aditya Roy Kapur, Varun Dhawan, Sonakshi Sinha, Sanjay Dutt and Madhuri Dixit Nene in pivotal roles. Set to release on April 17, the film is directed by Abhishek Varman and produced by Dharma Productions.